With reports that the Rev. Fred Phelps Sr. dead, many quipped the Westboro Baptist Church, the very organization he founded, would picket his funeral as they have so many others in the past. It might sound like a joke, but apparently it’s the real deal: The WBC will hold a demonstration at the funeral of their former pastor. Phelps Sr., 84, got back in the news Sunday when his estranged son Nathan posted a note to Facebook saying the pastor is currently in hospice care and was excommunicated from the organization for reasons that remain unclear. As twisted as it may be, his daughter Margie (who is a part of the WBC) said on Twitter the hate-fueled organization would definitely be at his funeral, if only to picket. 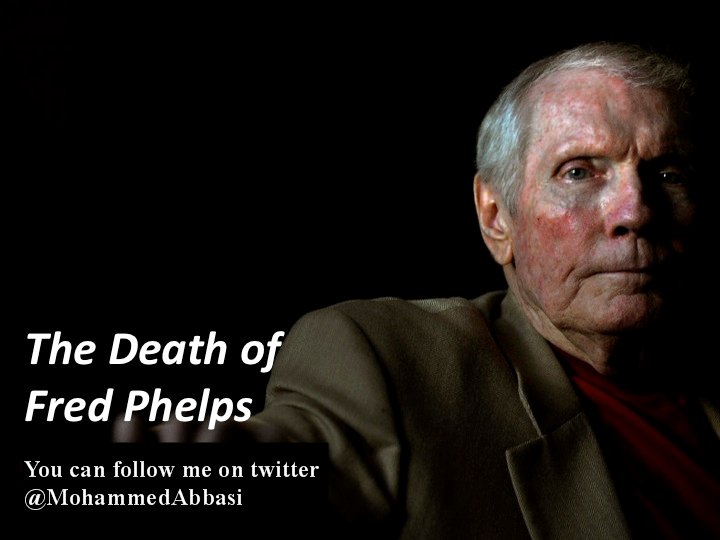 Speculation as to why he was excommunicated is rampant on the Internet, with some assuming the WBC members found out Phelps was actually gay and others thinking he might have had a change in heart as his health declined. There’s no definite answer as of now.